It is a restricted trekking area. So, to trek in Kanchenjunga, you need a local guide and at least 2 trekkers to collect necessary permits. Kanchenjunga Circuit trek is less popular than Everest Base Camp Trek or Annapurna Base Camp Trek. That means it is not crowded and still remote. And, you can experience remote Nepali cultures, foods, and lifestyle in its traditional form during this trek. Kanchenjunga trek is a tea-house trek. Tea-house treks have small lodges with least variety of food and lodges along the trek route. The word Kanchenjunga comes from the Tibetan word referring to “Five great treasures in the snow”. This symbolizes its five peaks as gold, silver, precious stones, grain and holy scriptures. Mt. Kanchenjunga (8,585 m) is the world’s third highest peak. Kanchenjunga is towards the far-eastern part of Nepal protected under the Kanchenjunga Conservation Area Project. The conservation area hosts several species such as pheasant, dragon, snow leopard, black bear, red panda, etc. So, there are lesser trekkers hiking in the Kanchenjunga area. And plenty of wildlife and natural heritage. The natural heritage will mesmerize you throughout the journey with least human influence. As the trek commences, you will witness the slow change in the landscape. And a variation in vegetation and wildlife. This route encompasses Himalayan coniferous forests, alpine shrub, meadows, and grasslands. This challenging adventure gives you plenty of adventurous and amazing memory to cherish for lifetime. You can visit Kanchenjunga through two treks, either the Northern Base Camp or the Southern Base Camp. If you choose both on the same trip, it can be difficult given the diversity and irregularity of its landscape. Post-earthquake situation: Is trekking to Kanchenjunga Circuit Trek safe? Wildlife such as Snow leopard, Musk deer, Red panda, etc. The eastern part of Nepal escaped the earthquake compared to the western and central regions. There was no report of death and casualty in the Kanchenjunga Trekking Circuit. The region did not witness any crack in the houses or avalanche in the mountain. This trek marks as safe to travel. Moreover, the trails have no obstruction and the landscape is also in good conditions. The mountains stand tall for the trekkers to view its magnificent beauty. 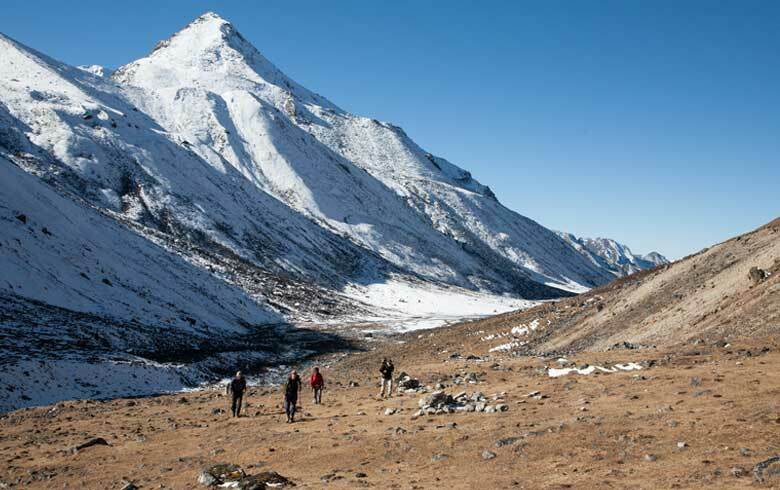 The most favorable seasons to trek in Nepal are autumn (September-November) and spring (March-May). One of the best seasons to trek is in autumn. It is the time when the greenery of forests and colorful rhododendrons surround the trails. You can enjoy the serene view of mountains, clear sky in the perfect weather and temperature. As the winter ends, spring brings a beautiful ambiance for trekking. The temperatures are moderate while the scenes are spectacular of the mountains. The wildlife is also seen during this time to bask in the sun’s heat. But, it is quite risky to travel during summer (June-August) as it is a rainy season. During the cold winter (December-February), the trails covers with snow and the trek is full of risk. Kanchenjunga trek provides you the scenic beauty of Nepal. It is through its landscape, forests, wildlife, and culture. The remoteness and wilderness of the region make it difficult to cover both Northern and Southern camp in the same trip. But, you can do it by adding extra days to the journey. To reduce trek time, you may choose between any two base camp. Either Kanchenjunga North Base Camp Trek or Kanchenjunga South Base Camp Trek. Given the height of Pangpema View Point (5388m), the North Base Camp is more adventurous. It is rich in wildlife and vegetation than the South Base Camp that reaches up to Oktang. The North Base Camp trek route starts from a different destination. This trek is more adventurous in greater altitude than in the South Camp. To make it comfortable, you can get a direct flight of 45 minutes from Kathmandu to Bhadrapur. Even the air flight will be an experience due to the beautiful view of Mt. Everest, Mt. Lhotse, etc. You can then take a jeep for 40 minutes’ drive to Birtamod. You need good rest for your trekking. So, it will be better to stay overnight in Birtamod. You can take a bus to Taplejung early morning. It will cover most of your day. You can begin your adventurous journey on the third day after departure from Kathmandu. You will begin your trek at a lower altitude and escalate through 6-7 hours of trek each day. The registered guides make this trek a memorable one and assist you every time. In the highest altitude of Pangpema, you will witness beautiful glaciers and peaks in the Kanchenjunga range. Day 1: Flight from Kathmandu to Bhadrapur (45 minutes approx.). Not boring at all. The beautiful view of mountains like Mt. Everest will provide a warm welcome to your expedition. You need to take a trip to Birtamod (40 minutes approx.) in a jeep. You can enjoy Nepali food and rest for the night. It is a lower altitude region so the temperature will be high. Day 2: Bus from Birtamod to Taplejung on a local bus (8-10 hours approx.). The busy road will take your entire day. You can see the beautiful hills along the way. To start a hectic trek, it’s better to enjoy amenities for an extra day in Taplejung. Day 3: Finally, you will start yours once in a lifetime trek. Trek starts from Taplejung to Chiruwa (around 1,200 m). It will be 6 to 7 hours of trekking on the first day. Day 4: From Chiruwa, you will reach to Lelep. This trek of 5 to 6 hours will pass through Tapethok checkpoint. It is a restricted area. So, you can rest for the day in Lelep. Day 5: Trek from Lelep to Amjilosa. It is about 5 hours’ journey. The track is much slippery in this region. You need to wear a good pair of boots and be careful on this trail. Day 6: Trek from Amjilosa to Gyabla. You will witness cultural changes and Tibetan influenced lifestyle in these regions. Day 7: Trek from Gyabla to Gunsa (4 to 5 hours). It is the capital of Kanchenjunga region. The area has good telecommunication facilities, accommodation, and good meals. Day 8: Acclimatization day in Ghunsa (3,475m). You can visit nearby ridge and enjoy the view of Jannu Peak. You can leave your materials as you will enjoy this sightseeing and get back to the place. Day 9: Trek from Ghunsa to Kambachen (around 4,100m). There will be a drastic rise in altitude with steep and difficult trails. You need to be careful with wooden bridges. Day 10: You can acclimatize in this Kambachen for the day. You can rest for further difficult altitudes that come every day. Day 11: You need to trek a high altitude from Kambachen to Lhonak (around 4790m). The facilities are quite basic but you are finally in the lap of mountains and grassy plains. Day 12: Trek from Lhonak to Pangpema (5140m). A walk of 3 hours and you reach the highest point of the North base. It is difficult to find spaces for accommodation. You can either camp there or return back on the same day. Day 14: Trek back from Ghunsa to Amjilosa. You are returning back to better facilities and warmer climates. It will take about 7 hours. Day 15: Trek back from Amjilosa to Tapethok. You need to plan to come out of the restricted zone by the day end. It will take almost 7 hours. Day 16: Trek back from Tapethok to Mitlung. The journey downhill will be around 7 hours long. Day 17: You finally arrive at Taplejung. You can rest at Birtamod in a private jeep or else rest in Taplejung for the day. Day 18: A bus ride from Taplejung to Birtamod. It will be around 8 to 10 hours. South Base Camp has much easy trail than the North Base Camp. But, the scenery is nonetheless. You can enjoy the view of mountains and glacier. You will meet amazing people in Yamphuding and Mamangkhe with authentic Nepali culture. This region hosts basic facilities of accommodation such as small stone huts. But, these facilities may not be available throughout the year. After your arrival, you can take a jeep from Bhadrapur to Birtamod (40 minutes approx.). Day 2: Bus from Birtamod to Taplejung. The journey will be 8 to 10 hours due to the busy road. Day 5: Trek from Khesewa to Mamangkhe (1786m). The region homes people of Rai and Kirat community. This cultural enriched region allows you enough company while walking. Day 7: Finally, you get to rest in Yamphuding for a day. On this day in Yamphuding, you will explore the village and take rest from the tiresome journey. Day 8: Trek from Yamphuding to Tortong (approx. 3000m). You will need all your strength to trek in this steep trail. It will be a tiresome 9 to 10 hours journey. Day 9: Trek Yamphuding to Cheram (3800m). You can be thankful for this short journey. It will be a 4 to 5-hour trek. Day 10: Trek from Cheram to Ramche (4600m). This high altitude will be one of the toughest treks. It will take 3 hours from Cheram. To reach the South base camp, you need to hike 2 hours from Ramche. Day 11: Trek back from Ramche to Torongding. The journey will be 6 to 7 hours long. Day 12: Trek back from Torongding to Yamphuding. The trek will be 7 to 8 hours. It will not be easy even though its descending downhill. Day 13: Trek back from Yamphuding to Khebang. The journey will be 5 to 6 hours long. It is a rare trail and they have a proper facility for home-stay. Day 16: You can drive back to Bhadrapur in 40-minute drive and then take a flight back to Kathmandu. There are a few requirements to meet before you come for this trek to Kanchenjunga. In this forbidden area, you need a special trekking permit issued by Nepal Tourism Board. You need to have an acceptable passport and visa to come to Nepal through air flight or through roadways. Plus, this trek is not allowed for solo hiking. Thus, you need to contact a trekking agency that provides guides as well. So, you must book your trekking plans ahead of visiting the country or book it after you arrive at Kathmandu. If you enter any protected region or sanctuaries along the trails, you need to register at the entrance. The trip can start from Biratnagar or Suketar. So, you can book a domestic air ticket if you want to reduce the days of your trip. Otherwise, the bus can be an option to travel from Kathmandu to Suketar. The tickets are handy except during the festivals such as Dashain that falls in October. You must carry your identification document, permits, and passport along the way. In case of any problems, it is better to contact trekking agency or your home country’s embassy for help. You need two permits for this region. First is a special Restricted Area Permit issued for a weekly basis. Second is the Kanchenjunga Conservation Area Project Entry Permit, which works for a month. You need to collect special permits to visit this region, which you can collect on your arrival. The system of advance reservation is not available. So, you need to get two trekkers per group who are usually authorized guide by the government. The permit for Kanchenjunga Conservation Area will be around NRs. 2000 (20 USD) issued by Nepal Tourism Board in Kathmandu. This region hosts a diversity of cultures. To explore this diversity is an amazing experience along the journey. This tea-house trek will provide you with glimpses of a variety of ethnic groups. Also, their cuisines as the altitude escalate. You can enjoy and learn about their cultures, foods, and languages during home stays at the end of the day. You will meet traditional Brahmins and Chhetris in the lower trails while beginning the journey. They speak English and Nepali is their main language. It also has a dense population of Limbu and Sherpa community. They speak a different language than national language, Nepali. But, they are familiar with English because of high tourist attraction to the region. Kanchenjunga Circuit Trek has varieties of landscape and vegetation along the way. It starts at low-land of Terai, coniferous forests, grasslands, and meadows. This diversity of vegetation provides shelter to even diverse wildlife. The Kanchenjunga Conservation Area is a Global eco-region according to World Wildlife Fund. So, it is famous for some rare species such as snow leopard, black bear, musk deer, red pheasant, etc. Thirty variety of rhododendron and 69 variety of orchids astonish you if you visit during autumn. The trails will have beautiful colors added by the flowers. Added with enchanting sounds of birds and wildlife. You will witness basic forests of Pine, Fir, Bamboo, and Hemlock in the lower altitude. In the higher altitude, Pines and Junipers are rare. You definitely know that the trek is not going to be an easy one. Given the remoteness of the region, you might not get every basic thing for your personal comfort. So, I have listed a few of things you need to carry to make it less difficult. Depending on the time of travel, you need to pack your clothing. But, the higher altitudes are always cold and have the risk of altitude sickness. So, be careful when you pack. Trekking boots are your best friends and life saviors. Without a comfortable pair of these, you cannot imagine walking even a few kilometers. The rough pathway, snowy landscape, and difficult altitude will demand a strong pair of boots. It must have thick soles to prevent bruises. We would recommend you to get the best hiking boots recommended for plantar fasciitis. It will not be comfortable wearing boots entire day after all the dirt and damp along the way. You need to let it dry and wear a comfortable slipper with socks. It will help you relax your feet at the end of the day. It will be easy in a lodge or homestay in the evening. It is better to bring socks along with shoes. The temperature varies between lower and higher altitudes. It may be hot in the afternoon. So, it is better to carry two kinds of socks i.e. thick and thin to be comfortable during the trip. You must carry few pairs because of the lengthy nature of the trek. It is not wise to trek with heavy baggage. So, you might not be able to change clothes regularly. But underwear is must-haves to deal with sweat and remain hygienic. You need to prepare well for the changing temperature. So, fleece jackets are the must to keep you warm and protect from any sickness in the journey. You can layer up your clothing but the temperature drops down to even -20 degrees in April. It will be a huge mistake if you don’t have the best backpacking rain jackets for backup. Not only does it protect you from the cold breeze, but also from the irregular weather. It is better to carry less during the trek. Having 2-3 trekking trousers, it will be enough for the trek. While a few pairs for sightseeing in the capital will be enough. It is also helpful to carry light full sleeves T-shirt to protect from forests and insects as well as the heat. You should carry simple and comfortable clothing for the trek. And avoid excess baggage. The region is well known for its forbidden landscape. You need to be safe in case of lack of lodging and spaces available during hectic travel seasons. You can carry a tent in a group or individual for your personal safety. You may not be comfortable with the primitive lodging facilities. So, it is good to carry a sleeping bag of your own to relax after a tiring day. Even though bed and other facilities are available, you need to be ready for the difficulty in remote areas. While trekking in such routes, poles can definitely make it a lot easier. It reduces pressure on the knees and supports to continue the trek. It even prevents from falling and getting hurt. As you plan to reach the base camp, its normal for your hands to feel numb with snow. So, a warm pair of gloves will be helpful after reaching the higher altitude. You will not get sanitary pads and tampons in the remote areas. You can get them in the capital after arrival or pack it while coming. It is better to be safe for such a long journey. So, carry the amount you may need. The toilets are not advance in some areas compared to the others. But, over the years, the area has developed. But, it is useful to carry your essentials such as toilet paper, hand sanitizer, sunscreen, soap, shampoo sachets, toothpaste, and brush. After a tiresome day, you might want to relax. It is a good option to carry cards, cubes, novel, snacks and mini chocolate bars. This will help to boost energy between trek. You don’t have to pay for extra charges after permit. You need to cover accommodation, food, and potters if needed. Though they are cheap compared to hotels, you need to have money to be safe for any unpredictable situation. The cost varies based on the number of days for the trek. Trekking is for adventure seekers seeking to trek in high altitude. If you love to view untouched natural scenery, authentic lifestyles, primitive way of living, then Kanchenjunga trek is best for you. It is best for outgoing and adventure oriented souls. Who wish to spend their 2-3 week’s time away from the regular hustle-bustle. And enjoy nature, adjust to the available services. Being a restricted area, the solo trek is not allowed in this region. You can encounter high risk in such a wild and uneven topography. The rule demands a companion along the journey or in a group with a registered guide. The trails might lead to difficult landscapes and even the communication is poor. You will rarely meet a large group of people along the journey except in the lodges. So, it is not an option to trek alone in this region. The trek starts at lower Terai which is almost plain region. As you progress further each day, the risk and topography vary. The trails are rough and uneven. The path will be comfortable based on less weight of baggage and comfortable shoes. You must have a good pair of boots and socks to deal with uneven lands. It can be slippery during the rainy season. You must not trek for such a long distance if you have respiratory problems or asthma. Even heart patients must avoid this hectic trek. The person with a constant panic attack from minor adventures should never plan to do it. It is your guts and determination to reach Kanchenjunga base that drives you to the end. You need to be ready for at least 6 hours of a trek in a day. How are the accommodation facilities in the region? Being a remote region, the lodges are not standard like in the other cities. You will get basic facilities to rest after a tiresome day. These rural homestays will provide you with ethnic foods. After a hectic day, you will have a roof to hide and a good bed to rest. What are some of the most important things I need to carry? In trek, it’s better to carry less. You must not miss out suitable clothing like waterproof jackets. Be prepared for a change in temperature as altitude rises. The most essential element is a good pair of shoes and socks. You will get basic foods in the lodge. The foods will be cheap and fresh. But, you can carry snacks and energy bars while on trails to boost your energy. Don’t make your backpack heavy. It is always helpful to train yourself for a tiresome journey to reach the beautiful end. You can do exercises every day before starting the trip to prepare your muscle strength. Jogging and aerobics can help before arriving in the region. How much time should I devote for this trek? You need to have at least 3 weeks for this journey. The rough trails and high altitude will demand few extra days if you want to take it slow. You will not call this most difficult one for a trekking route. But, with less number of tourists trekking in this region, you will experience a wilderness compared to other areas. You need to carry the necessary personal equipment to make this journey as easy as possible. The best recommended time for trekking is in autumn (September – November). This is the time to witness clear weather, perfect temperature, and less slippery trails. The other season is in spring (March-May). Is it worthwhile? Totally. The adventure Kanchenjunga offers keeps you amazed. Yes, it will be more than this when you actually visit this peaceful region. We hope, you received most of the information to make up your mind.